The Transpennine Railway built in the 1860’s was the last element in the economic and industrial infrastructure that gave the region its world importance in the 19th Century. 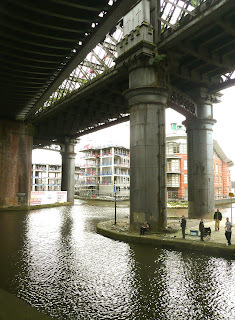 The Castlefield basin in Manchester connected the Leeds - Liverpool canal to this new ‘superhighway’, making the region one of the most densely populated and urbanised places in the world. EP Niblock will be participating in artranspennine08 with ‘Killing Castlefield’*, an examination of this granddaddy of urban renaissance, success story of the nineties and triumphantly designated ‘Britain’s first Urban Heritage Park’, exploring narratives of the city past and present and interrogating accepted orthodoxies surrounding dominant models of urban renewal. Now once again faced with neglect, dereliction and an uncertain future as developers close in and for sale signs proliferate, the shortcomings of other similarly hailed flagship developments is put under the microscope, symptomatic of prevailing policies of urban regeneration and the increasing ‘branding’ of our cities, effectively taking the ‘cityscape’ out of the public sphere and into a privatised realm. Euphemia Pubert Niblock, adventurer, archaeologist, intrepid explorer and flaneuse is an archetypal antiquarian and bluestocking epitomising the spirit of the Edwardian age. EP Niblock is an ongoing research project, a call to arms for the forgotten contribution of the dilettante, the amateur, the polymath, a vehicle with which to articulate a response to the contemporaneous through an interdisciplinary lens, creating an ongoing ‘artwork’ and ‘archaeology of us’, influenced by Shank’s notion of the archaeological imagination and Irit Rogoff’s ‘curious’ eye. An intersection on the ven diagram of theoretical archaeology and visual culture studies, the construction of Miss Niblock provides a promising methodology with which to re-examine issues and current debates on location, memory, public space, citizenship and social relationships. Biographical note: As the 20th century dawned, Niblock’s daring exploits, expeditions across the territories of the ancient near east, Ottoman and Byzantine empires, involvement in the notorious great game and fearless personality were the talk of society: in her day as celebrated as contemporaries Gertrude Bell and Freya Stark, her notorious rivalry with Agatha Christie over the excavations at Mesopotamia was ultimately her downfall. Upon her return to England after the Great War she bequeathed much of her library, excavation findings and site reports to the Owens university museum at Manchester and dedicated herself to cataloguing and researching her vast collection. In later years something of a recluse, her gradual disappearance barely raised an eyebrow and she soon became forgotten, a mere footnote in history. But that wasn’t to be the end of this redoubtable spinster. Upon stumbling out of the bowels of the new Manchester Museum extension in 2003 where she had been accidentally incarcerated since its 1920’s refurbishments and into the brand new 21st century, Niblock has begun making something of a name for herself once more, taking up residency with an unlikely assortment of artists, curators and writers in Brunswick off the Oxford Rd corridor, an unlikely survivor and relic constantly bewildered by her unexpected navigations into the contemporary cultural landscape. The development of her journal ‘Diary of a Bluestocking’ into an ongoing blog and her engagement with new media such as her facebook profile have provided her with a whole new audience and raison d’etre, focusing her anachronistic gaze on the city, the built environment, contemporary art practices and the dialogues made possible by examining various experimentations and collaborations across disciplines.